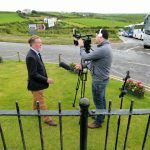 Tuesday, 28th June 2016 will forever be remembered in the history of Bushmills, as the day on which HM Queen Elizabeth II came to the town to unveil the bronze statue to one of Bushmills’ heroic sons, Robert Quigg who won the Victoria Cross for his gallantry at the Battle of the Somme on 1st July I9I6. 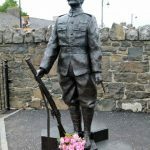 The bronze statue project was led by Robert Quigg’s great nephew, Leonard Quigg and the committee of the Commemoration Society, Robert Thompson and Keith Beattie, and the majority or the money for the statue had been contributed by the local community. 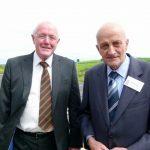 When the Ulster History Circle approached Leonard Quigg about the possibility of unveiling a blue plaque to Robert Quigg VC, after Her Majesty had left Bushmills, he was very receptive of the idea. 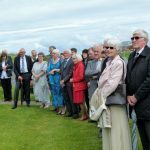 So on the afternoon of 28th June, a large contingent of Robert Quigg’s extended families which included Quiggs, Nesbitts, Beatties, Sherrards, McCartney, Hughes and Ward from Canada, Knox and McAfees, arrived at the old schoolhouse at the Giant’s Causeway, to watch a blue plaque to their ancestor being unveiled by Jean Gibson from Scotland, the niece of Robert Quigg VC. 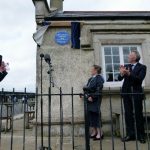 Welcoming everyone to the very special day and ceremony, Chris Spurr, Chairman-Ulster History Circle, thanked Seymour and Carol Sweeney, the owners of the Nook Restaurant, for permitting the blue plaque to be put up on the building which was once the schoolhouse where Robert Quigg attended as a young boy. Chris said that the commemoration was taking place almost 100 years to the day, when Robert Quigg’s valour won him the Victoria Cross. 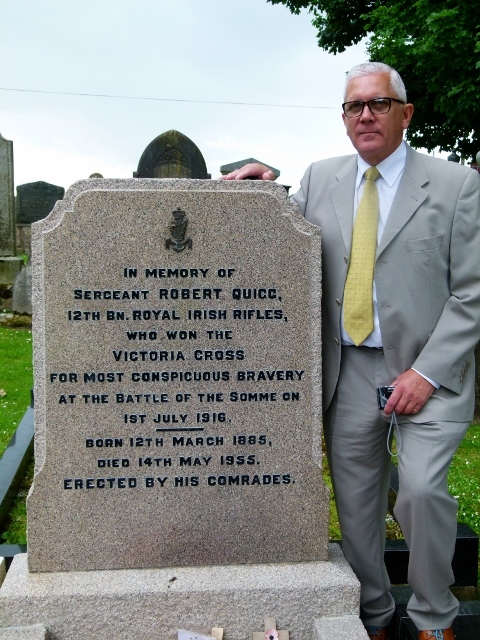 Robert Quigg’s citation described how he had advanced 3 times with his platoon to assault the German lines. 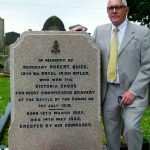 When Robert heard that his platoon officer, Sir Harry Macnaghten, the son of the local landowner, Lady Macnaghten, was lying wounded on No Man’s Land, for 7 hours Robert went out under heavy machine gun fire to look for him. 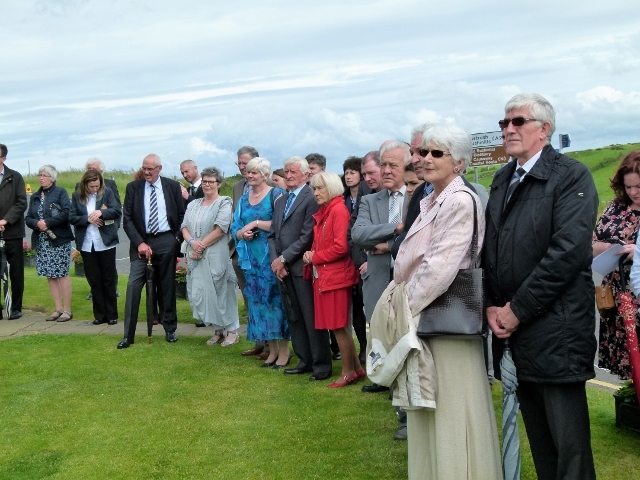 His body was never found but on each sortie, Robert Quigg brought back wounded men and one such man was Robert Matthews of Mosside who survived, and whose family Robert and Louise Matthews were guests at the unveiling of the plaque. Speeches were heard from Leonard Quigg, Ian Paisley MP, and Ian Crozier, CEO-Ulster Scots Agency who sponsored the plaque, and before going inside the old schoolhouse to enjoy refreshments, Chris Spurr said that the day in Bushmills would most certainly go down in the annals of history of the History Circle, as being a very special day indeed, one which could never be repeated. 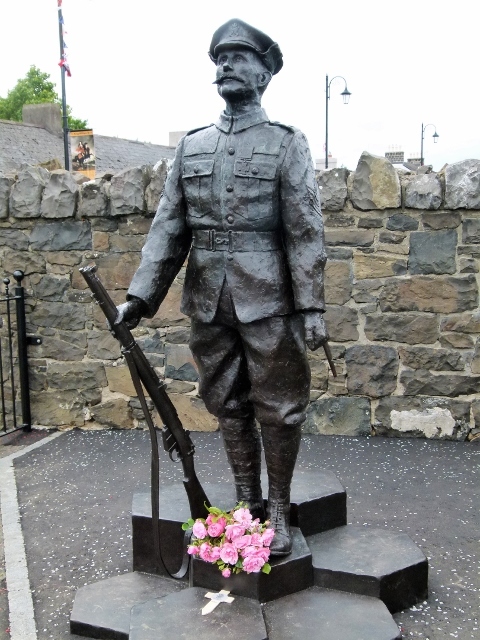 The bronze statue of Robert Quigg VC by renowned sculptor, David Annand, in Bushmills. 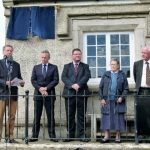 The statue was unveiled in the morning by Her Majesty the Queen. 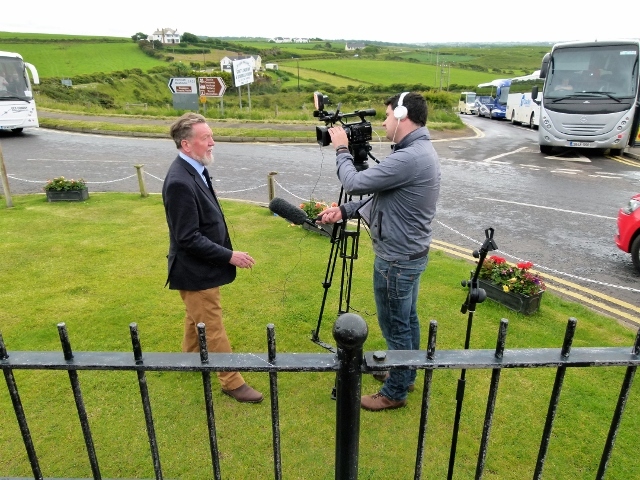 Outside the Old School House, Giants Causeway, (now the Nook Restaurant) Chris Spurr-Chairman, Ulster History Circle being interviewed by NVTV. L.r. Leonard Quigg, great nephew of Robert Quigg VC and Robert Thompson, local WW1 historian. 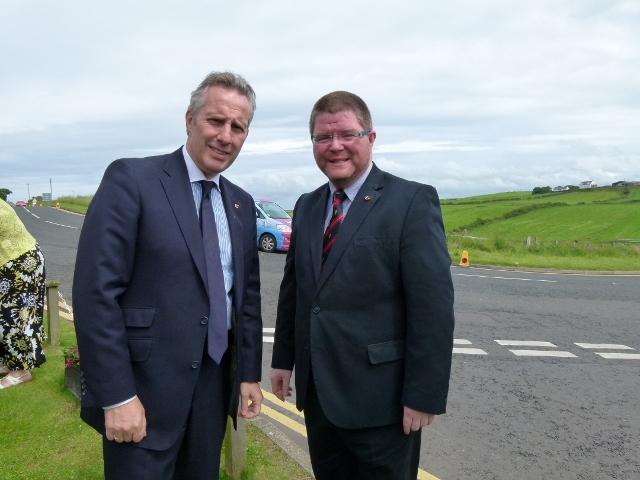 Ian Paisley MP. 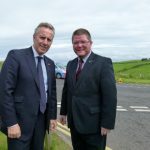 with CEO -Ulster Scots Agency, Ian Crozier. Guests who included many Quigg family members watch the ceremony. l.r. 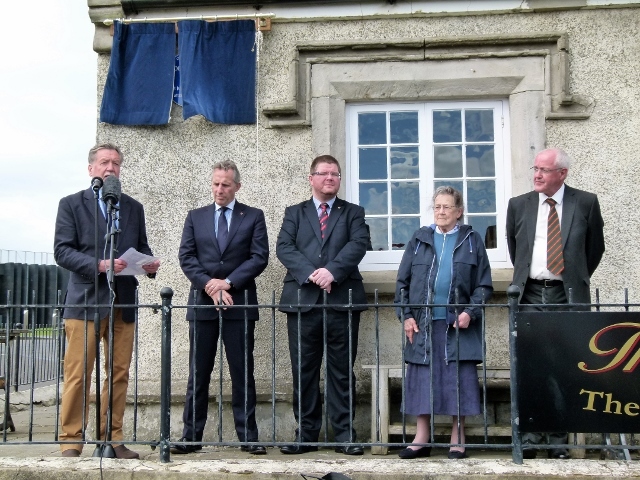 – Chris Spurr, Ian Paisley MP, Ian Crozier, Jean Gibson, niece of Robert Quigg VC and Leonard Quigg, great nephew. 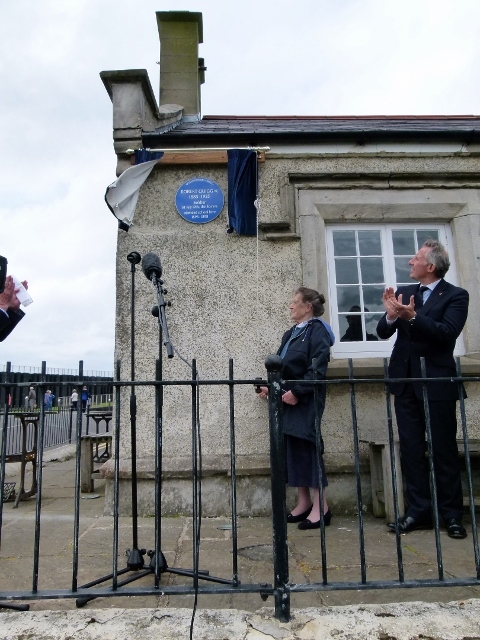 Jean Gibson from Scotland, niece of Robert Quigg, unveils the blue plaque. 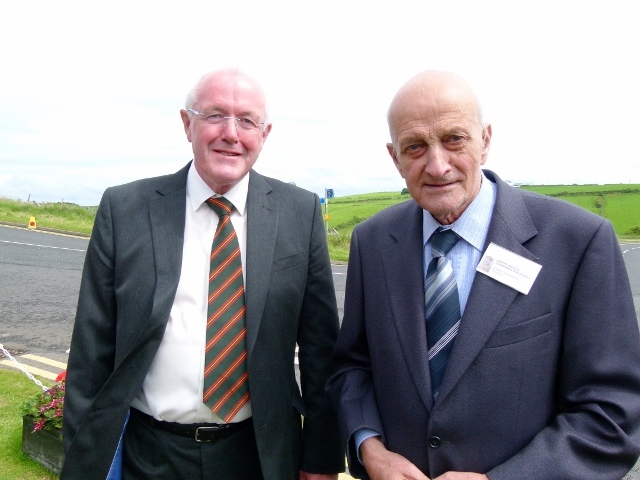 Alan Boyd, Secretary – Ulster History Circle, at Robert Quigg’s Grave in Billy Parish Church, Bushmills.